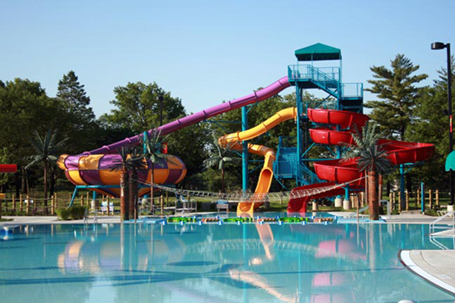 After residents voted on a $5.9 million referendum to bring a new pool to the site of their old pool, the Lombard Park District is enjoying Paradise Bay Water Park. The new park has aquatic experiences for young swimmers, senior swimmers, and everyone in between. Turtle Cove has been designed for parents and children younger than four years old with water depths from zero to two feet. A large umbrella in the middle of the pool provides shade for tot’s delicate skin. A palm tree with slides and water raining down coconuts keeps little ones busy while a soft turtle and starfish are easy for kids to climb on. Three full-length waterslides and one 12 ft. drop slide take care of the wilder bunch. The red Sidewinder and yellow Pipeline start 30 ft. in the air. The Sidewinder takes sliders through twists and turns for about 13 seconds, while the Pipeline is a faster drop slide that takes less than five seconds for riders to reach the bottom. The purple and yellow Wipeout spins riders around two to six times before dropping them four ft. into an eight ft. pool. The old six lane lap pool has been replaced by an eight lane 25-yard pool with shaded bleacher seating. The lap and diving pools can be roped off for events to keep the majority of the pool’s facilities open to customers.